Football season may seem like an eternity away...a little less than five months to be honest...but this weekend Bulldog fans can at least begin to dust off the Red and Black and the tailgating gear. G-day is here. And this year&apos;s scrimmage game has much more incentive than years past. The game starts at 2 p.m. but get here early, seating is general admission so getting 50 yard line views is all up to you. 1. 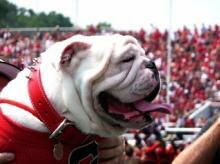 Stafford is gone and it is time for Joe Cox to prove what he&apos;s got to the bulldog nation. 2. Count Knowshon and the class of &apos;08 out as well...this breed of bulldog is full of new talent. 3. ESPN! Kirk Herbstreit and the gang have already made there way to Athens as ESPN covers the game live from Athens. This will be the only collegiate spring practice game broadcast slated to appear. 4. It&apos;s a steal. Tickets are only $5 for adults and $3 for youth. Tickets can be purchased in person at the Butts-Mehre ticket windows between 8:30 am-4:30 pm through Friday, April 6 and also beginning at 12:30 pm on the day of the game at Sanford Stadium Gates 2, 4, 6 and the Main Gate located below the Sanford Drive Bridge. 5. There won&apos;t be any Gator fans at this game...at least we hope. For more coverage of the game click here. If you are looking for ideas while in town click here. In the meantime, here is your chance to practice the stadium chants...in case you have forgotten.